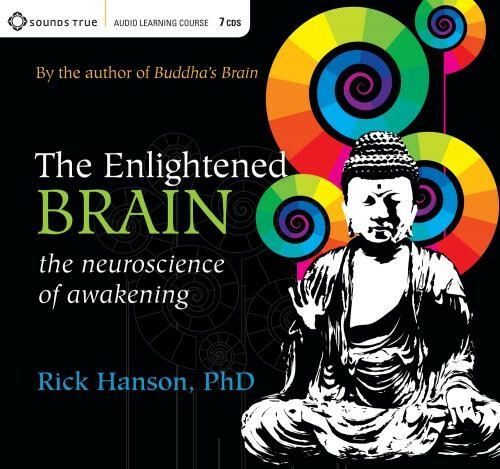 Meditation meets neuroscience—practical tools to reshape your brain for awakening. Explain how to tailor psychological growth and spiritual practice to your unique neurophysiology. Summarize how to defeat the negativity bias of your brain by internalizing key resources. Practice pairing positive experiences with negative material to soothe and heal old pain. Apply techniques to activate the neural foundations of mindfulness. Practice strengthening the five factors of concentration and deep meditative absorption. Utilize exercises to build neural shock absorbers for stable inner peace in a turbulent world. Consumer Orientation: This course is appropriate for virtually anyone over the age of twelve. Value: Hanson is a reputable neuropsychologist and his techniques are firmly grounded in science. The effectiveness of these techniques is well-established. Strengths: Hanson's presentation of the material is easy to understand and easy to follow, and the guided practices themselves are simple, logical, and straightforward. Every talk is rich with interesting information that also has direct practical implications. Weaknesses: Many meditators will find the guided meditations in this series to be too short/condensed. The series is designed in such a way that the meditations are essentially embedded into lectures. While this design is certainly conducive to learning the methods, you may find yourself feeling as though you still need to do a proper meditation despite having just completed a session. Some sessions span across the end of one disc to the beginning of another, whereas one session per disc would probably have been the preferable format. Helpful post! The feature is formed with the excellent material of words. You have completed the need of this topic. Rick Hanson has the ability to explain concepts in simple terms that most people can understand and apply to their own situation. I was in law enforcement for over twenty-eight years and I wish I had a mentor like Rick during those years.